Arriving on the island of Torcello, after the crowds and noise of Venice, is a wonder. The small water bus from the island of Burano, leaves visitors at a recently restored dock. As you walk along the one navigable canal on the island, you begin to feel the years fade to the time of Venice’s founding. For over one thousand years, Torcello was the seat of the Bishop of Venice and, in the Cathedral of Santa Maria Assunta, are the remains of the patron saint of the island, Heliodorus. The peace and quiet of the island has been disturbed in recent years to allow for the restoration of the fondamente (the walkway along the canal) and to facilitate the restoration of several restaurants and cafes. The Locanda Cipriani, owned by the same family of Venice’s famed Hotel Cipriani, is an oasis of calm and exceptional service – the island’s only full service hotel. If your desire is for retreat and relaxation in a hotel little known by tourists, this is your place. Along the way, visitors pass the Ponte del Diavolo (Devil’s Bridge) near the Osteria of the same name. This is a comfortable place for a cappuccino either before or after your visit to the cathedral. What brings people to an island of only sixteen year round residents? The mosaics in the cathedral are among the most finely restored Byzantine art in the Mediterranean. 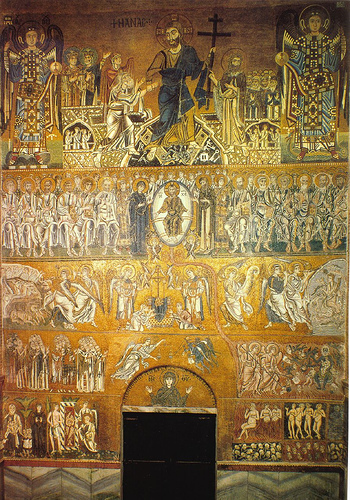 The “Final Judgement” is breathtaking, and well worth the forty-five minute trip from the city of Venice. If you arrive early – before the cathedral opens at 10:00AM, you will experience a sense of history and mystery unlike most islands in the lagoon. Early mornings are by far the best time to visit. Groups of pilgrims and tourists usually begin arriving around 10:30AM each day. If you are at the cathedral ticket office when it opens at 10:15AM, you will enjoy your visit with little interruption from those crowds. This is a treasure of a place and I highly recommend a visit while you are visiting bella Venezia. Purchase an IMOB card for unlimited travel on the vaporetto network at any ACTV ticket window. These cards are available in varying time segments, from twenty four hours to one month. See www.actv.it/en/imob/imob for details. For route maps of the Venice Water Bus and land system, go to ACTV. Boats run every forty minutes between Torcello and Burano, the only public service available between those two islands. Return services to Venice are available throughout the day from Burano to either St. Mark’s Square, Murano and other major locations in the city.